1. The video is three years old and referring to different scopes. Has the situation changed in the meantime, perhaps through software upgrades or new hardware revisione? 2. Dave is using a 1 MHz carrier signal - I have no intention of using FFT in that frequency range. I'll probably staying in the audio frequency range. Even if the FFT isn't stellar, is it more usable in this range? 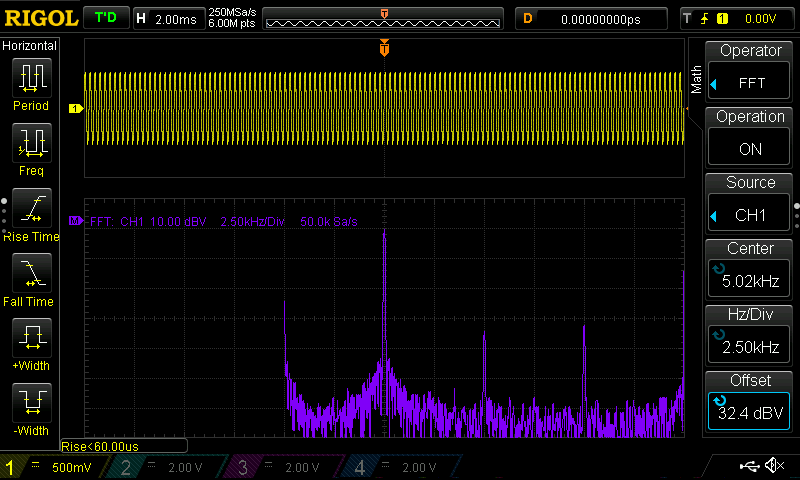 Re: Rigol MSO1074 - current FFT status? a) There's been a firmware update since then that improves the FFT. It's still not awesome but it's a lot better than in that video. b) Do you need a standalone device? You sound like a candidate for an Analog Discovery II. More bits in the ADC is everything when you're doing FFTs. The second issue is long-term support. If Rigol or any other software manufacturer stopped releasing scope firmware upgrades, the scopes would still keep working the way they were. For host-based systems these days, pretty much constant software updates are required to keep up with the "improvements" that Microsoft, Apple or even the Linux community come up with (already got that issue with some of my audio devices). I'd rather spend a little more on an integrated device that I can pull off the shelf in 5 or 10 years time, turn on and It Just Works[tm] than save a little money now and end up with an expensive brick if the manufacturer goes belly-up or decides to drop support in favor of a New And Improved product. However, nothing's been decided yet - thanks for the heads-up, I might look into these options as well. If you have a Raspberry PI then it has an audio output that could be used as the signal generator. That way you could buy a (much cheaper) DS1054Z, or maybe the 2-channel Siglent (which costs a few $ more but has a slightly better FFT). Volker, I completely understand your argument regarding PC-based gear, but since you are interested in audio AND is concerned about the FFT, then becomes a matter of actually doing something useful with your equipment. The Rigol will give you a waveform visualization and measurements (where it shines) but it will be more concerning with low level signals (noisy analog inputs) and a very rough estimate of the frequency components and sinewave purity (due to the very limited FFT). Other oscilloscopes have better FFT (Siglent SDS1202X-E, for example), bit I am not familiar with their analog performance. I would try to take into consideration the extra resolution of the Discovery and its post processing capabilities. However, for audio there is also the alternative of choosing a software and a sound card. LM358 crossover distortion. 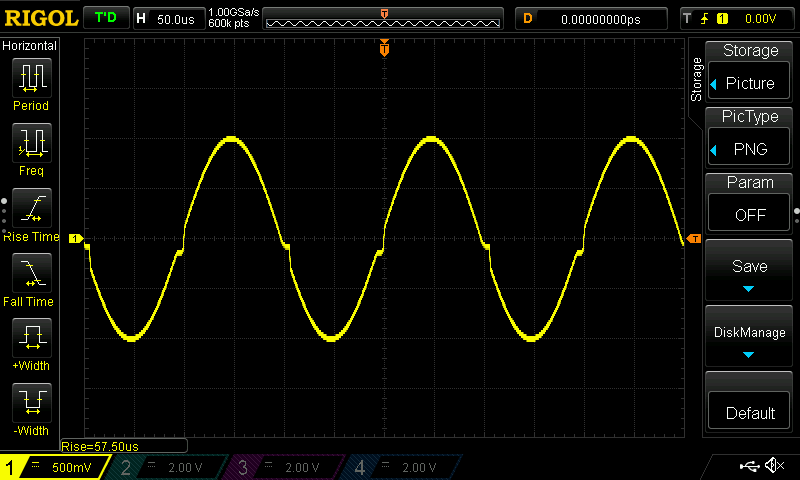 2v p-p 5KHz sine. And the FFT output. You can see the harmonics. Centre frequency is 5KHz and you can see the next harmonics. You can zoom out here easily to see the remainder of the harmonic products. I've used it for RF up to about 14MHz as well. It's acceptable there. If you want a real bit of kit here you will have to fish out for an expensive dynamic signal analyser or spectrum analyser. Or just buy a decent sound card (I used M-Audio Audiophile 2496) and use some software but then you have line level and impedance hell to deal with. Vwegert, Not sure I understand your long term concerns for the Analog Discovery. The software platform is very mature at this point, though Digilent still occasionally releases updates. Regardless of the company's future, I don't see the AD becoming useless. There is a USB issue that prevents the AD from running on the RP but it will run on the Beaglebone. Mine runs quite nicely on a 10 year old Win box running Win 7 Home that my employer was recycling. I picked up my second AD, the original version 1, on eBay for $50 last year. It is the same as the AD2 except for the PS. I like the Analog Discovery. But the USB connection is damageable. And there are only 2 true sensitivities. If I remember right +- 2.5V and +- 25V. All other sensitivities are digital zoom. The system requirements for the Waveforms software are not so secret. "For Linux®, the application is available in DEB and RPM packages for 32 and 64-bit systems. The required Digilent Adept Runtime must be installed separately." Another option is the Analog Devices ADALM-2000. It is similar to the Analog Discovery but priced at around $100-$150. I think software is open source and it is almost ready to use on Windows and compile from source on Linux / Mac OS X. Dig a little deeper, Digilent puts out extremely detailed info and their tech support through the forum is excellent. You will find pretty much anything you want to know about the AD's in the forum. Be aware that though they claim excellent compatibility with Apple OS's some users have had problems. Unfortunately I am clueless on Linux, but their Windows compatibility is excellent. And be kind to that little USB connector as has been mentioned, as well as the 25 volt input limit. If you have old eyes(i am 66) spreading a scope and AWG across dual 25 inch screens is really nice.